When I heard this song with the opening riff coming from that 5 string G turning that he is known for I loved it. I bought the album Talk is Cheap which some reviews half-jokingly called it the best Rolling Stones album in years. The song got plenty of play on rock stations at the time. It peaked at #3 in the Mainstream Rock Tracks. The album was recorded in a period where Mick and Keith were feuding with each other about the direction of the Stones. They were not recording or playing live. “You Don’t Move Me Anymore” off of the album points at right at Mick. Personally, I’ve always liked Keith Richards voice. Happy, Salt of the Earth, You Got the Silver, Before They Make Me Run rank with my favorite Stones songs. This song would fit on any Stones album. The band Keith put together was great. Take a look around you, tell me, what do you see? Pattie Boyd is a beautiful woman who was the inspiration for many great songs. She was married to George Harrison and then to Eric Clapton. The three most well-known songs were Something (Beatles), Layla (Derek and the Dominos…Eric Clapton) and Wonderful Tonight. She worked in London, New York, and Paris, side by side with the world’s top models. Boyd appeared in the UK and Italian editions of Vogue magazine, as well as in several commercials. George Harrison met Pattie while filming “A Hard Day’s Night” in 1964 and they married in 1966. George and Patti were a hip couple in 1960’s Swinging London. By the early seventies, George and Pattie were having problems and it didn’t help that Eric Clapton was pursuing Pattie and that is when Layla was written. In 1974 Pattie ran off with Eric with George’s blessings. George and Eric remained friends and would visit and work with each other in the future. A quote from Pattie “The first Christmas after I’d left him, in 1974, just as Eric and I were sitting down to lunch, George burst in, uninvited,” Boyd says in her autobiography. “He had some wine and Christmas pudding with us. I couldn’t believe how friendly he and Eric were towards each other.” Pattie and George’s divorce was final in 1977 and George married Olivia Trinidad Arias. They would stay married until George’s death. George stayed friends with Pattie till the end. Pattie and Eric were married in 1979. At the reception, Paul, George, and Ringo played together but there is confusion on why John Lennon was not invited other than he lived in America at the time. Later it was reported that John did say he would have loved to be there. The marriage was a painful one for both. Clapton had a drinking problem through most of the marriage. Pattie left Eric in 1986 after Lory Del Santo had Clapton’s child. Ironically, it was Clapton who once said that his marriage had suffered because he and Boyd couldn’t have children. Practicing with others was clearly not a solution. 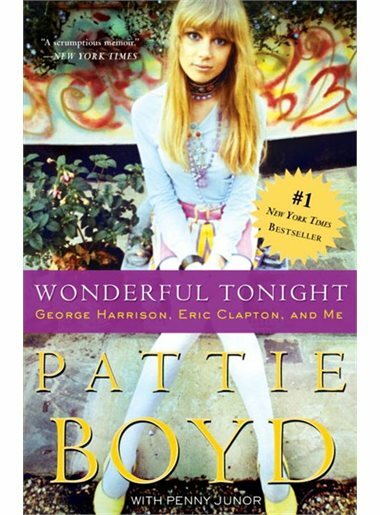 Pattie Boyd’s autobiography is an interesting read. Pattie would say that being married during the Beatles years was not an easy thing. If she went to the concerts she and the other wives and girlfriends would sometimes be chased, kicked, and pushed by jealous fans. This is part of an interview with Taylor Swift interviewing Pattie Boyd. Read the full interview here. Taylor Swift: I remember seeing a picture of the house, and Mick Jagger and Marianne Faithfull had spray-painted their names on the wall with the words mick and marianne were here. I read a book about Richard Burton and Elizabeth Taylor recently, and how there was this crazy frenzy surrounding them. In the book, Elizabeth is quoted as saying, “It could be worse, we could be the Beatles.” You are one of the only people who can say they experienced what Beatlemania was like from the inside. How did that feel for you? Pattie Boyd: In my first experience, I found it absolutely terrifying. I got to see the Beatles play at a theater in London, and George told me that I should leave with my friends before the last number. So before the last song, we got up from our seats and walked toward the nearest exit door, and there were these girls behind me. They followed us out, and they were kicking me and pulling my hair and pushing us all the way down this long passageway. Great pop song from 1966. It peaked at #5 in the Billboard 100 and #3 in Canada. The song is constructed so well and has influenced countless artists. They did have one more top twenty hit in 1967 with Pretty Ballerina. The band helped start “baroque & roll” because of the classical arrangements and melodies. .
Michael Brown wrote the song but the band fought constantly so after the success of the single Brown was putting together a new Left Banke to tour that included Michael McKean (Lavergne and Shirley and Spinal Tap) on guitar but that didn’t last long. The original band regrouped in 1967 and recorded a song but then broke up for good. Rolling Stone placed “Walk Away Renée” at number 220 in the 500 Greatest Songs of All Time. from his friends Bob Calilli and Tony Sansone. Brown wrote it after meeting Renee Fladen, the girlfriend of the band’s bass player. Renee Fladen was in the control room when Michael Brown tried to record his harpsichord part. He later said in an interview that he was so nervous trying to play with the beautiful Renee present that his hands were shaking. In the end, he gave up and returned later when he recorded it without any problem. The line “Just walk away Renee” is often misinterpreted as “Don’t walk away Renee.” The singer has decided that Renee will never return his affections and is better off with her out of his life. Antoine “Fats” Domino Jr. was not flashy and wild like some of his 1950s peers such as Elvis, Little Richard, and Jerry Lee Lewis. The first I heard of Fats Domino was on “Happy Days” and the song Blueberry Hill. I was at a relative’s yard sale when I was a kid and was given his greatest hits. Domino was the youngest of eight children in a musical family, he spoke Creole French before learning English. At age 7 his brother in law taught him how to play the piano. By the time he was 10, he was already performing as a singer and pianist. Fat’s first hit in the Billboard 100 was the great “Aint That A Shame” in 1955 written by Fats Domino and Dave Bartholomew that peaked at #16 and his last charting song was a cover of the Beatles “Lady Madonna”(great version) that peaked at #100 in 1968. He had 45 songs in the top 100 and 4 top 10 hits…many more top 10 hits in the R&B Charts. My favorite song by him is “I’m Walking” because it’s so simple but yet effective. The odd beat sounds modern and it hooks you. He was inspired to write the song when his car broke down and someone said “Hey Fats Domino is Walking” and he thought to himself…Yea I’m walking. Ricky Nelson covered the song and it went to number 4 on the charts. What is sad to me is Pat Boone covered Aint That a Shame and it went to number 1 while Fat’s version only made it to 16 in the same year. That was the era where some parents would buy their kids the Pat Boone version of the song and the kids would hide their self-bought Fats Domino version… Same went with Little Richard also. Domino received The Lifetime Achievement Grammy, a National Medal of the Arts from President Bill Clinton and the induction into the Rock and Roll Hall of Fame. Fats semi-retired in the 80s and said he would not travel outside of New Orleans. During Hurricane Katrina, he lost most of his possessions and him and his family were rescued by the coast guard. He unselfishly made many personal appearances to raise money for the hurricane relief. His house was hit hard and he lost his National Medal and gold records but George Bush gave him another medal to replace the lost one and the RIAA gave him replacement gold records. To raise money for repairs for his own home, friends and fellow musicians recorded a tribute album, Goin’ Home: A Tribute to Fats Domino, featuring the likes of Robert Plant, Elton John, and Sir Paul McCartney. He as living in New Orleans at the time of his death on October 24, 2017. Here is an article stating that Fats Domino helped start “ska” music. What ‘ya gonna do when the well runs dry? What ‘ya gonna do when I say bye-bye? I don’t know how many people know this song but it took me twenty years to find it. I heard it in 1986 on an oldies station. I just caught the middle to the end and it intrigued me. Every time they would play it I would not catch who it was…it never dawned on me to call the station and ask. It was kind of haunting to me but I loved it. It took me till around 2008 to remember enough of it to track it down. It was released in 1960 and peaked at #3 in the Billboard 100. This was their one and only top ten hit. It was written by Eugene Pearson. Oh, pretty baby, won’t you hold me in your arms? This song never gets old and listening to Al’s voice certainly never gets old. This song peaked at #11 on the Billboard 100. Al Green has had twenty songs in the Billboard top 100, eight top 10 songs and a #1 with Let’s Stay Together. Al Green is currently the Pastor at Full Gospel Tabernacle Church in Memphis TN. From Songfacts on writing the song. According to Rolling Stone Magazine’s 500 Greatest Singles, this came to Green when he woke up before dawn the day after a show in Detroit at a motel in rural Michigan with a song forming in his mind. Half an hour later, he had it written, but his producer Willie Mitchell wasn’t much interested in Green performing his own material. Said Green: “I was toting my song around in my pocket for days on end, saying, ‘Hey, I got a song.’ Finally, at the end of the session, I said, ‘Well, I still got a song. '” It became Green’s first hit. Just as soon as you can. Show me where it’s at, baby. Honey, love me if you can. In my dreams, nobody but you, baby. Maybe the most famous tear in pop culture. Iron Eyes Cody, an actor in Native American clothing showing us the tragedy of littering. He made his debut in 1971 at the close of a public service advertisement for the anti-litter organization Keep America Beautiful. Born on April 3, 1904, as Espera Oscar de Corti, Cody’s parents were both Sicilian immigrants (Antonio de Corti and wife, Francesca Salpietra). He grew up in Gueydan, Vermilion Parish, Louisiana, where his parents ran a grocery store. He portrayed Indians in television shows and movies dating back to 1926. His last appearance was in the 1970s spoof movie The Spirit of 76 released in 1990. He played the role on-screen as well as off…He would deny he wasn’t Native American as late as 1996 and until he passed away in 1999 at the age of 94. Real or not he did have an effect on me…To a young kid, this hit home. I remember this commercial rather well and there is another anti-littering commercial that I remember. Only people in Tennessee would probably remember it was called “Tennessee Trash.” I have it below the Iron Eye’s Cody video. The below commercial in 1976 was so popular that they remade it twenty-two years later. I have to say the song will stay in your head. It was filmed on an unopened stretch of I-24 at the time. The theme was sung by country singer-songwriter Ed Bruce and features Irving Kane as the ultimate litterbug.